Meriden, Conn.-based Water Factory Systems, a division of CUNO Inc., announces the world’s most advanced water purification technologies in a compact, convenient package for all your household drinking water needs. 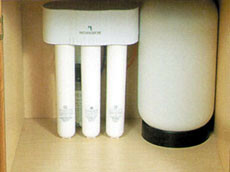 Let your family enjoy clean, healthful and fresh tasting water with a reverse osmosis drinking water system. The pressurized operation provides optimal contaminant rejection. The average reduction of TDS is 98 percent. Plus, the system provides up to 100 percent better nitrate reduction.